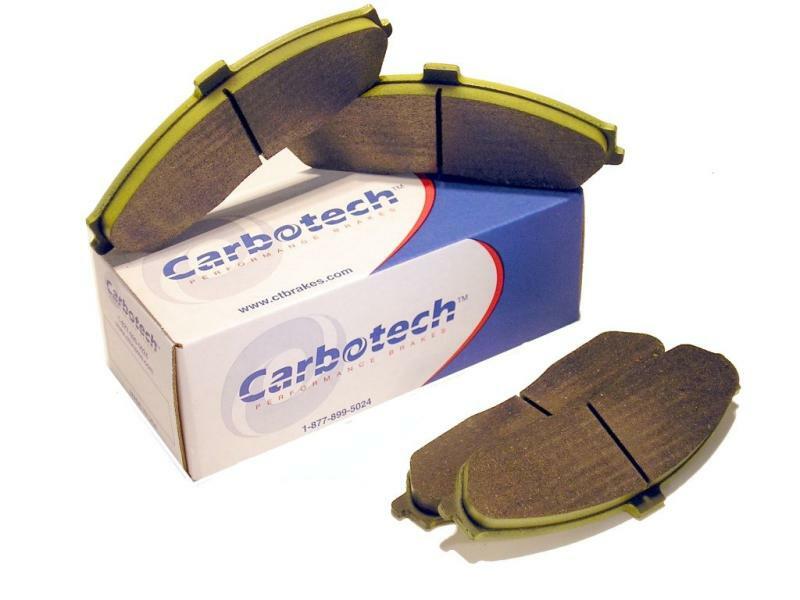 Carbotech AX6 Brake Pads - Dezod Motorsports Inc - Home of the automotive performance enthusiast since 2002. The AX6 takes the place of the Panther Plus compound that was so successful. AX6 was specifically engineered for Autocross applications. A high torque brake compound delivering reliable and consistent performance over a very wide operating temperature range (150°F to 1250°F +). Advanced compound matrix provides an excellent initial “bite”, high coefficient of friction, and very progressive brake modulation and release characteristics. AX6 offers high fade resistance, rotor friendliness at all temperatures, excellent cold stopping power, and non corrosive dust. As a result, AX6 is an excellent choice for Autocross & novice track day drivers and beginner high performance driver education (HPDE) drivers on street driven cars using street tires eliminating the need to change brake pads at the track. AX6 has gained tremendous popularity with SCCA Prosolo/Solo2 competitors for its fantastic bite, release & modulation. Many drivers use the AX6 for street driving as well, even though Carbotech doesn’t recommend street driving with AX6 due to possible elevated levels of dust and noise. AX6 is NOT a race compound, and should not be used as such. AX6 shouldn’t be used by any intermediate or advanced track day drivers, and should not be used with “R” compound tires (racing tires). Cars in excess of 300hp and/or 3,000lbs should not use AX6 for any track use. For Drum applications turn to the Carbotech 913 Kelated Metallic. A D.O.T.-approved high-performance compound for brake shoes on high performance street vehicles and race cars. Carbotech Kelated Metallic (CKM) achieves a very high coefficient of friction (approx. 0.48 to 0.50) by taking advantage of a chemical reaction within the friction mass, which creates a tri-alloy metallic film at the liner/drum interface when subjected to heat and pressure. Designed to overcome the shortcomings of other liner materials, CKM is a very versatile and provides excellent braking performance in a wide variety of applications. Excellent wear characteristics and a very high resistance to lock-up under hard braking. Optimal recommended operating temperature range is from ambient to 750°F.